Começo iluminando abaixo da sobrancelha com uma sombra branca opaca (Branquin) e esfumo o côncavo com uma sombra marrom claro com sub tom rosado (Nunete). I start highlighting the brow bone with a matte white eyeshadow (Branquin) then I apply in the crease a light brown eyeshadow with pinkish undertone (Nunete) and blend it. 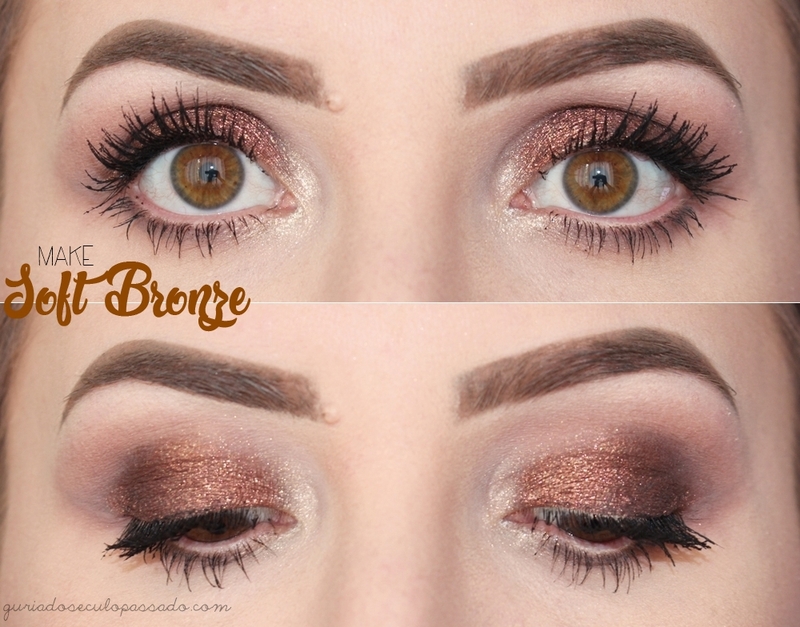 Aplico um primer pra olhos em toda pálpebra e por cima um pigmento com glitter na cor Gold Brown. Esfumo as bordas com um pincel de esfumar pequeno. I apply an eye primer all over the lid and over it a glitter pigment in Gold Brown. I blend the edges with a small blending brush. Rente aos cílios inferiores, uso o pincel que apliquei o pigmento sem pegar mais produto e esfumo o canto externo. Depois com a sombra marrom claro com sub tom rosado (Nunete), finalizo o esfumado. No canto interno aplico uma sombra glitter branco dourado e finalizo a maquiagem aplicando muita máscara pra cílios! Close to the lower lash line, I use the brush I applied the pigment withou taking more product and blend just in the outer part. Then I finish the blending using the light brown eyeshadow with pinkish undertone (Nunete). In the inner corner I apply a white gold glitter eyeshadow and finish the look applying many coats of mascara. Demorou, mas acertou kkkkk. Ficou incrível! uhauahuahauh sério... nunca tive tanto trabalho pra fazer um make! Deu trabalho, mas super valeu a pena. Sensa esse Gold Brown! Fiquei apaixonada. a sombra é muito maravilhosa! pena dar tanto trabalho! mas quero tentar usar mais vezes ainda!